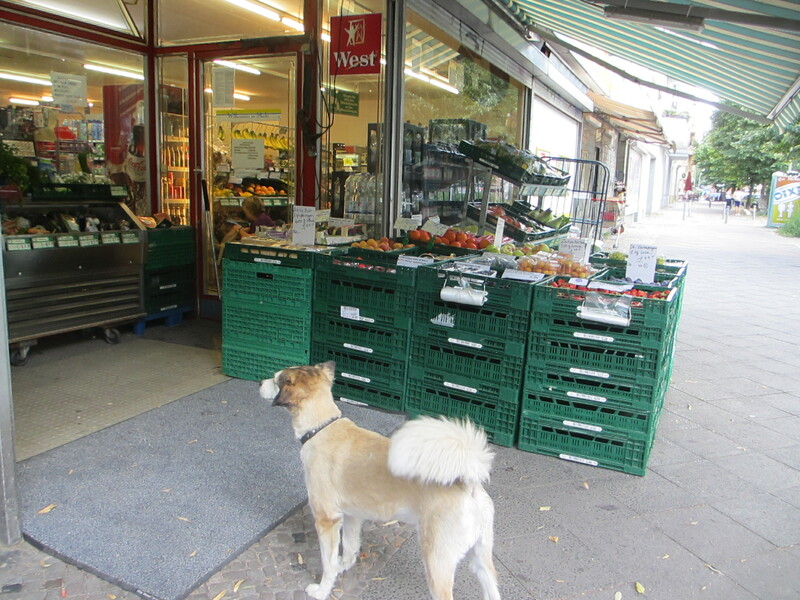 This dog is no dummy; with no need for a leash, he will stand outside this grocery store and wait for his owner if it takes all day, because he knows that if he walked even a block in any direction, he too would be lost. Normally I have a good sense of direction. I like to sort my neighborhood, city, region and beyond by north, south, east and west. This is normal, isn’t it? But I can’t do that here. I keep trying, but it’s slow in coming. Our street is one block long, and it curves. It is lovely, but it will not help orient you. On one end you must turn left or right onto an east/west street. On the other end you can turn onto a north/south street. And those two streets intersect somewhere behind our building. I find that baffling. I have at least twice now left our apartment building, followed our street around the curve, taken a left the next street, reached the corner and thought, I’m finally getting somewhere. And then I look to the left and realize that all I’ve done is make a circle around the block, and it would have been much shorter to come out and make a right. I’d like to think I won’t make that mistake again, but I probably will. I thought that the tree in the circle at the three-street roundabout intersection in the middle of our one-block street would be a helpful marker, until I realized there is another maple tree in another three-way roundabout just two blocks from here, which is a little surreal. I walked down one of the offshoots with groceries last weekend with my keys pulled out, ready to unlock the front door of an apartment building that appeared to be in the right spot, but was not ours at all. That’s when I realized the tree in the circle had a clone, and that I needed to start paying more attention. Street names change every few blocks, for no apparent reason. You can be on a major street, a fairly straight street with traffic lights, and still it will change names after a major intersection. And if you’re anything like me, you might have thought the street would keep its name for more distance than that, so you don’t notice it changed names blocks ago. Once you notice, a cold dread creeps up your chest, and the word Dunce! echoes in your brain yet again, and there you are with your battered street map trying to figure out where the heck you ended up. And even though you see that you’re on an east-west road, you still don’t feel like it’s east-west, and so whatever new info your brain should have just learned, that little ah-ha moment is lost on you because you still have a sneaking suspicion that east is off to your right and west to your left, even though the map tells you otherwise. So there’s that kind of lost. And then there’s the language thing. You all said people speak English here, every last one of you said that to me at some point. And you’re not exactly wrong. But what you failed to mention is that when they’re not speaking to you, an American, they are speaking German to each other. So you have no idea what they might be talking about when you interrupt them, you just forever feel like a bull in a china shop, an arrogant American who didn’t bother to learn their language. And I saw that coming too, I guess, and decided to stay ignorant and see how that worked out for me, and I can tell you that it’s not working out so well after all. There’s also the sabbatical spouse thing. This is not, after all, my sabbatical. I am not a tenured professor at a prestigious Midwest college; that’s my husband, and I’m along for the ride. And I hear it coming, and you’re right, that’s the wrong attitude, but I haven’t mentally fixed that one yet either. Why do I deserve to be here? What am I doing here, anyway? I’m a French major living in Germany. I feel so much like a wife. It’s pathetic. If I were back home in St. Paul, I’d be trying to figure out what comes next in my working life. The nonprofit where I worked for the past seven years closed its doors in June, and I spent the summer scrambling to piece together what I could do from Berlin for the year. Piecing together a year’s worth of telecommuting contract work is not the same as assessing your career and pursuing a plan for the next job. I didn’t have time to think about it over the summer as we prepared for this year abroad, and now that I’m here I can’t do anything much about it even if I wanted to. So there’s that. Finally, I’m lost in the same ways you’re lost, though I’m not going to try to catalog my existential angst here. Not yet, anyway. Let’s just see what the year brings. This entry was posted in City life, Getting lost, Sabbatical and tagged Berlin, lost, sense of direction on September 10, 2013 by Jill M..
Is there some sort of group of English speaking women you could join? My niece spent 3 years in Sweden and found this helpful. Not sure how you find them, maybe the library? That’s a good idea. I do actually have a few local people I can talk to. Mainly I find it stressful approaching and talking to the various strangers I need to negotiate with — school secretaries, vendors, train conductors — who expect you to know a bit of German. Merie, I trust you on this. It IS hard to kick out all the props from under you, the whole network you’ve spent years building, and be alone with simply your family for a while. I think the kids are struggling with this too. It’s great to think we have few distractions, but it’s also scary to think we have few outlets. I’ll check out the talk. Jill – the whole “lost thing” and how we relate to it is so interesting to me. I find myself thinking of physical lost situations I’ve experienced – moving to the crazy street system in St. Paul ( from Minneapolis ) , leaning how use the local lite rail…..it seems so smallish in comparison to the many levels of lost you must be dealing with. Yet I feel a sense of the challenges and have faith that you will deal with it well. Thanks, Joan! I think I’ll adjust and find my way eventually. Mainly I have to just deal with the fact that I’m an outsider and that’s not going to go away. And it’s probably good for me in ways I’ll realize over time. Has anyone sent you this NYTimes article? It offers more ways to get lost. Thanks, Bebe — I appreciate the link.